← What is the true cost of attending SfN? The big one – Quo vadis Neuroscience? Alright everybody, this is it. This is what we have all been waiting for. This is the big one. 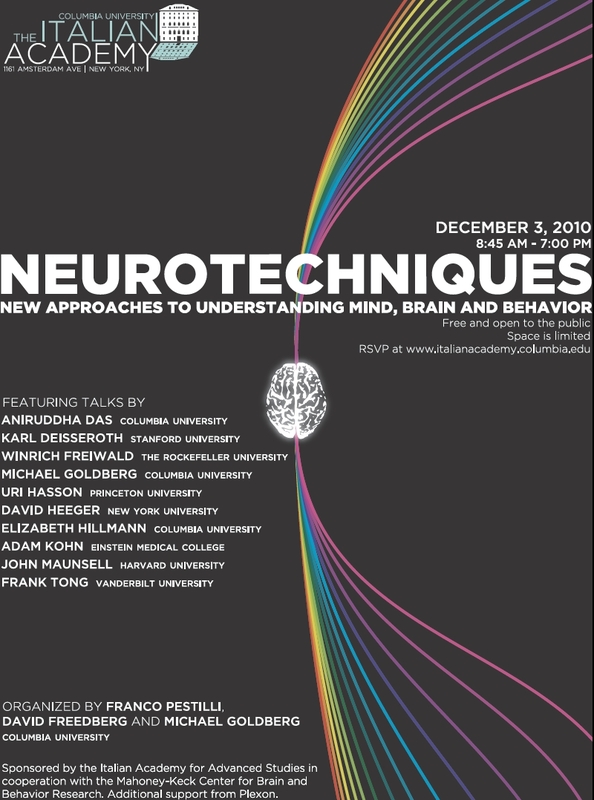 If you are a Neuroscientist, have a pulse and are within 100 miles of New York City, this is where you want to be on Friday: The Italian Academy at Columbia University. The Italian Academy has done impressive Neuroscience events in years past, but I simply do not understand how they managed to get all these big names this time around. The roster of speakers is excellent without exception, one talk seems more promising than the next. The topic itself is – well – extremely topical. One of the most urgent questions that our field faces is how to use all the new and exciting (as well as the somewhat old but no less exciting) methods to address (and hopefully answer) suitable theoretical questions. 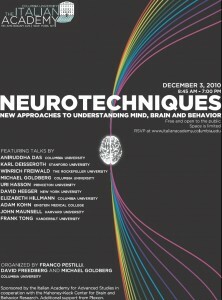 Historically, Neuroscience is an extremely methods-driven field. Theory tends to follow (if it ever does, that is). Thus, in a way, the outcome of this issue – the proper use of the many available techniques and methods – will shape our field for many years to come. The stakes could not be higher, neither could the quality of the lined up talks. To some, this might sound like gushing. It is not. I am actually actively trying to avoid getting too excited. In any case, I will be there. Friday, 8:45 am. You should consider it, too. Of course, life happens. So in case that you can’t make it (or live outside of the 100 mile radius), I will be reporting from the event. Therefore: Watch this space. 10:30-11:00 — Aniruddha Das: Simultaneous measurements of spikes and hemodynamics in alert subjects: What can brain imaging tell us about neural activity? This entry was posted in Administrative, Conference. Bookmark the permalink.